The Trevor Project, in conjunction with National Suicide Prevention Week (USA – September 7-13), launched a new ad campaign ”I’m Glad I Failed.” This effort targets lesbian, gay, bisexual, transgender and questioning (LGBTQ) teens who contemplate suicide as a result of homophobia. The ads feature four young people with stories about how intolerance and harassment led them to attempt suicide, and how glad they are that those attempts failed because their lives have changed for the better. The campaign, created by Better World Advertising, seeks to educate LGBTQ youth about The Trevor Helpline and raise the consciousness of broader audiences to the potentially life-shattering consequences of intolerance. 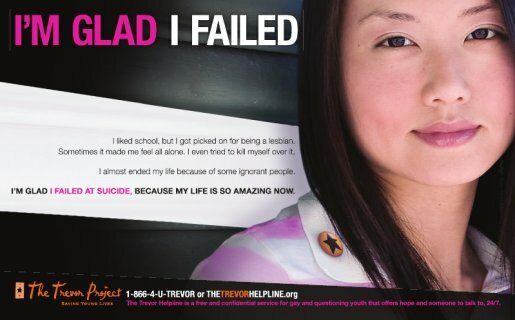 The Trevor Project is a non-profit organization that operates the only nationwide, around-the-clock crisis and suicide prevention helpline for lesbian, gay, bisexual, transgender and questioning (LGBTQ) youth. 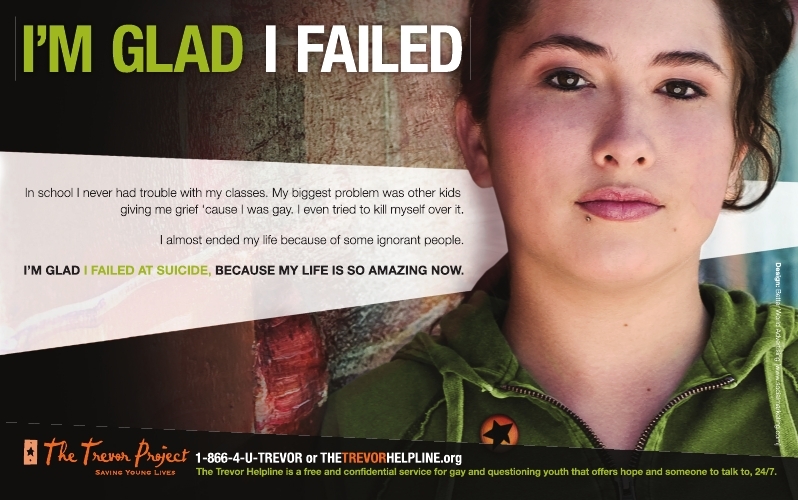 Each year, our helpline fields more than 15,000 calls from LGBTQ youth as well as their families, friends and educators. 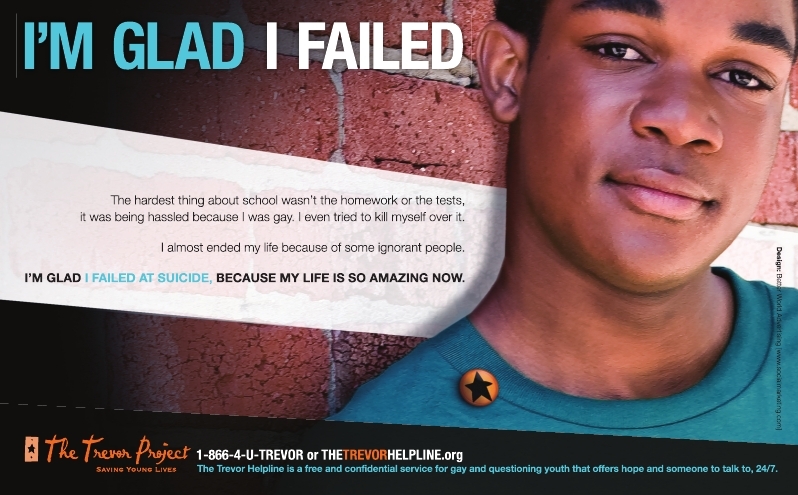 Every day, The Trevor Project saves lives through its free and confidential helpline, in-school workshops, Web site and educational materials. 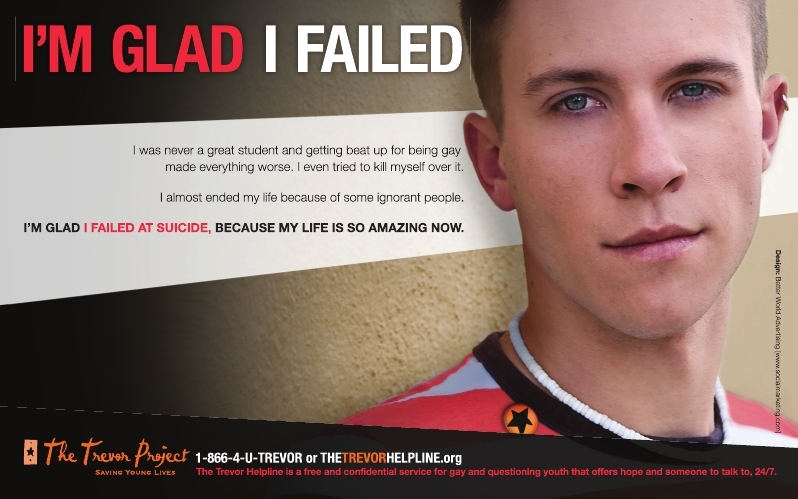 This campaign was developed at Better World Advertising, San Francisco, by creative director Les Pappas, art director Emily Foran and photographer Duane Cramer.